There is Power of the Words We Use: How Are You Using Your Power? There is power in the words we choose to use. How we use them, for good or for ill, is up to us. Words can move us to tears of joy or tears of sadness. Words can motivate us or tear us down. Words can have a long lasting after effect. 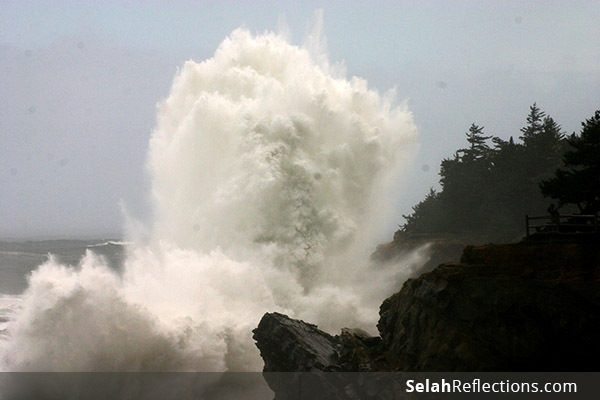 In March, we had a late Spring storm here along the Oregon Coast that produced a spectacular set of swells and crashing waves. What is interesting to me is that depending on the timing of the storm and the schedule of the tide, the big crashing waves may not even hit the coastline until 10-12 hours after the storm passes. It can take that long for the after effect of the storm, the big waves, to make its way inland. The words we use can have that same delayed effect. While harsh words spoken in anger, fear, or frustration can have an immediate impact, it’s the delayed effects that can be just as (possibly even more) destructive. The hearer of those words will think about them, wonder about them, possibly even relive them for days, weeks, or months later. Thankfully the opposite is also true. Words spoken in love and support can mean a lot in that moment in time, and your loving support and attention can also buoy and sustain a person long after these gifts of encouragement are spoken. There is beauty created out of a big storm, but there is destruction also. 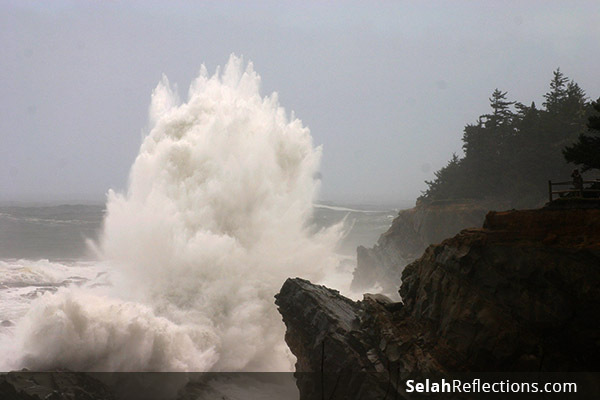 Witnessing these magnificent displays of ocean power can be awe inspiring. It leaves you humbled and feeling a bit small knowing there is nothing you can do but get out of the way. The words we use make a difference, not only in what words we give to others but what we give ourselves as well. There are things we say to ourselves that we would never say to another person. What we tell ourselves, and how we describe ourselves can be a form of self-care, but not if we use destructive words that make us feel small and stupid. Again, thankfully, we can also have the opposite effect by being gentle, giving ourselves grace, and speaking truth in love. Have you ever been to the beach with a sign “Beware of Waves”, or “Beware of Sneaker Waves”? Have you heard the saying, “Never turn your back on the sea”? I think that also applies to the words we use with ourselves, our children, spouses, blog readers, and loved ones. We have the power to effect a person, that goes beyond the here and now, an effect that can move through time, even without us being there. You can see the effects of these beautiful water displays along the coastline. The pounding erodes the cliff walls, taking what is there and pulling it down and creating more sand. Entire beaches can shift their landscape after a storm as piles of sand get shoved around. There is beauty being created through that erosion and tearing down. The smoothness of the rock face, the smooth pebbles we find on the beach, the lines and patterns that show up only after months and years of wave upon wave coming closer to the shoreline only to retreat and return later. Repetition of words and action can help mold a person into something beautiful or into something hurt and broken. It is easy to forget the effect of a word spoken offhand, without thinking, just like it is easy to forget that we need to respect the sea and never forget it’s power. “With great power comes great responsibility”, this wise advice for Superman is also wise advice for us! Let’s be aware of the words we choose, the words we give. Let’s be aware of the power of our words and the long-lasting effects they can have. So true–the after-affects of our words (and attitudes and actions) can be even greater than in the moment. I love what you did there–reminding us that we say things to ourselves that we would never say to another person. Youch! Thanks! That day was pretty incredible and awe inspiring. And yes on the words we use on ourselves. It is easy to ignore and not realize how we sabotage ourselves without even realizing it.